Last year, I joined the SCBWI (Society of Children's Book Writers and Illustrators) with a goal in mind: I wanted to branch out into drawing pictures for kids! I went to the LA Summer Conference and met some of the nicest, most supportive people in the world... and crammed my brain full of as much info as I could at the same time. I now had a mission: add stuff to my portfolio to attract children's publishing clients! Go go! Time's wastin', fam! Almost a year later, I'm excited to reveal my very first project: illustrations for the Robert Louis Stevenson poem My Shadow, published by Learning A to Z. These illustrations were meant to match the poem's stanzas by showing kids playing with their shadows at specific times of day. There was a scene with candlelight, sunset, noon, and one at early morning dawn. As I was working on the sketches for these, the only thing I could think about was my "Drawing From Imagination" professor, Stephen Player, and the day in his class where we had to learn about drawing shadows in perspective. A notoriously difficult course, that day was so taxing I went home and went to sleep out of sheer mental exhaustion! As I was painting, I made sure to reference my copy of Color and Light by James Gurney often since there were so many times of day to work with! If you're an artist, you should probably own a copy of that book. It's highly recommended, insanely useful, and pretty much a requirement to own! Get thee to Amazon and get a copy if you don't have it yet. I'll wait. 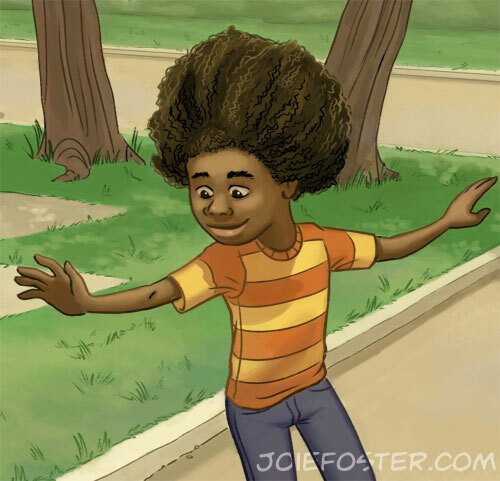 Detail shot of the skateboarding boy! With this particular piece, when the sketch round's notes came back, the AD asked me to add a car (specifically an early 70s Ford Pinto in orange) in the background. GASP! HORROR! The bane of many an artist's existence: drawing CARS! Somehow I soldiered on. 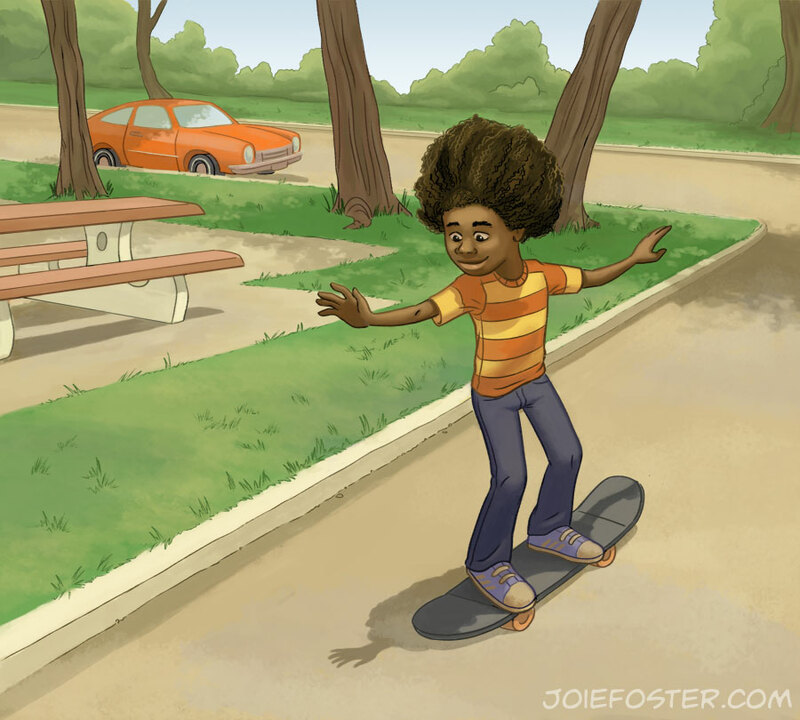 Detail shot of the car behind the skateboarding boy! This last one turned out to be my favorite from the series-- no, not because I enjoy painting 10,000 flowers-- but because of the color palette and mood. I've never painted a misty morning scene before, and I quiet enjoy the quiet moment it represents. 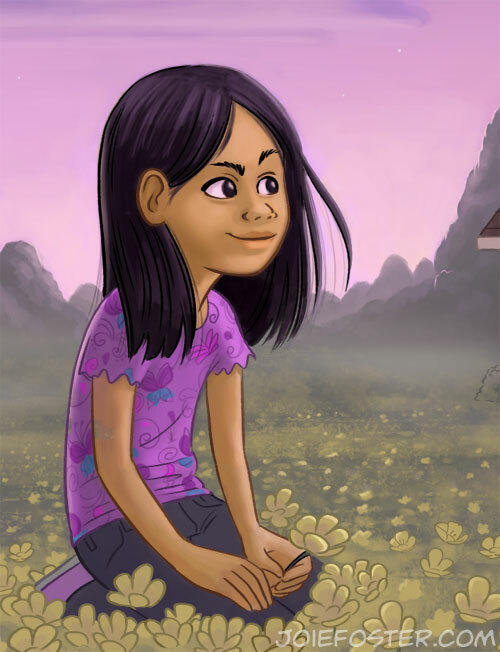 Some close-up detail of the girl in the flowers! All in all it was a terrifically fun project, and I hope to have more kidlit illustrations to share with you in the future! Which one of these is your favorite? Leave me a comment and tell me! 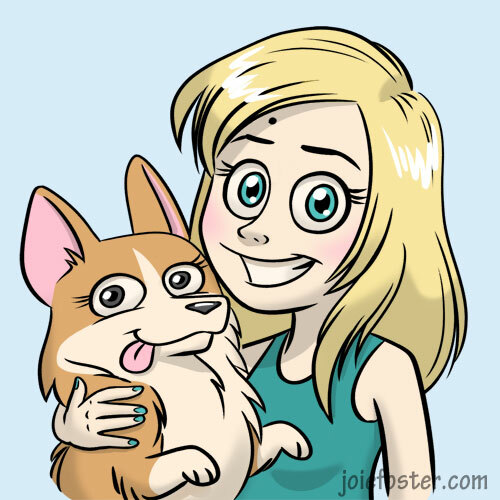 I'm a story artist and illustrator who loves corgis, nail art, glitter, and ballet-- not necessarily in that order. Enjoy my work and want to support me? Toss a few bucks into my tip jar-- it'll feed my Cake Habit. New Book: Aspen Mascots Halloween ComicFest 2018! Video: Adventures with Corgi Cam!